The Winter 2018 issue of Pacific Council Newsletter is now available on the Council’s website. 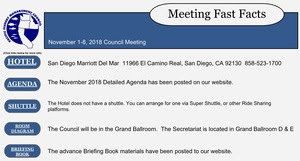 This newsletter reports mainly on decisions made at the November 2018 Pacific Fishery Management Council meeting. You may view past issues of the Council’s newsletter by visiting the Council’s Newsletter Archives webpage. If you have comments, questions, or suggestions regarding Pacific Council News, please direct them to: Ms. Jennifer Gilden, Information and Communications Specialist at (503) 820-2280 ext. 418 or toll free: 1-866-806-7204. At the November 2018 Council meeting, draft salmon rebuilding plans for Sacramento and Klamath River Fall Chinook were approved for public review, along with the Council’s suggested revisions to these two plans. The Salmon Technical Team will continue to develop these plans, and incorporate the suggested revisions. Updated drafts will be posted on the Council website for public comment in early January.